We all know that olives are fabulous in a martini, but did you know that when turned into E.V.O.O. 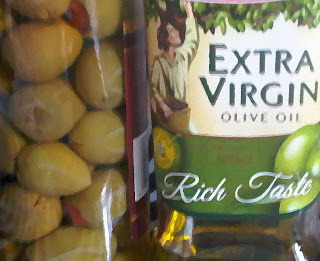 (extra virgin olive oil) they are also amazing for your skin, hair, and nails? High quality olive oil has many different health benefits due to the high amount of antioxidants found within it, as well as numerous vitamins and nutrients. High quality does not mean the "most expensive", just that the olive oil is as least processed as possible. Generally speaking E.V.O.O. is oil that has only been through one pressing, meaning it should still have many of its natural properties. Olive oil contains antioxidants that assist your body in neutralizing free radicals which would otherwise damage skin, causing signs of early aging. I purchase organic olive oil at the local market and in the winter I literally bath in it. I add several tablespoons to my bathwater (usually along with lavender essential oil). I also apply it directly to my hands and feet and even use it as a makeup remover! At around $15 for a large bottle, it actually seems very inexpensive in comparison to the many beauty creams on the market for upwards of $50. I really feel that since I have been using it regularly I can see a definite improvement in my skin and hair. Seems like a great idea for the winter months... I have such a hard time with keeping my hand from drying out... I will give it a try.